The constant struggle of wanting to lose weight and craving for good food is quite real. Losing weight is not an easy task. It requires proper diet and workout regime. However, a few dietary tweaks can come handy in the weight loss process, if done in the right manner. Losing weight does not mean that you have to cut down on all your favourite foods. For instance, sandwich is one delight that is loved by many. This filling and on-the-go snack can be prepared easily. Sandwiches tend to hinder our weight loss efforts when they are stuffed with greasy ingredients like butter, cheese, mayonnaise et al. So, if you are on a weight loss diet and still wish to gorge on sandwiches, fret not, as we’ve got your back. To convert the sandwiches into healthy ones, we’ve got some easy-peasy tips. 1. According to Dr. Shikha Sharma’s book, 100 Weight Loss Tips, one should use mustard sauce on sandwiches instead of butter as mustard has no fat and very little calories while butter is loaded with fat. The strong taste of mustard sauce is sure to enhance the flavour of the sandwich. 2. Dressings form a major component of sandwiches. While preparing healthy sandwiches, one has to make wise choices. For example, instead of using a mayonnaise-based dressing, you can opt for hung curd. You can mix hung curd with your choice of veggies. 3. Another way to cut off butter from sandwiches is by substituting it with baked garlic paste. Instead of spreading butter on bread, use baked garlic paste as it will only enhance the taste and nutritive value of the sandwich. 4. Replace regular cottage cheese with fat-free cottage cheese. You can make fat-free cottage cheese in the comforts of your kitchen by using low-fat milk. 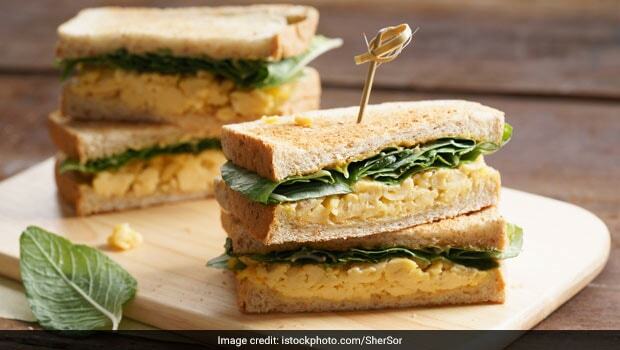 Now, that we’ve shared some handy tips with you, bring them to your rescue and gorge on healthy sandwiches without any guilt. Bon Appetit!